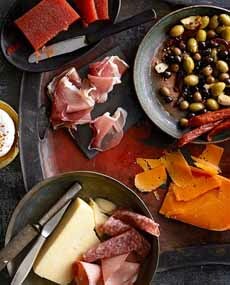  Serve membrillo (top left) with a charcuterie and/or cheese board. You can serve it whole or pre-slice it (photo courtesy Volpi Foods). 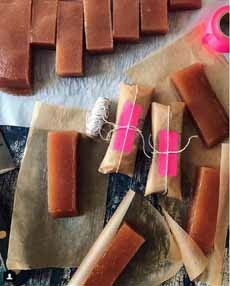 Homemade membrillo from food photographer and stylist Melina Hammer. Membrillo and the quince it is made from (photo courtesy Directo al Paladar). 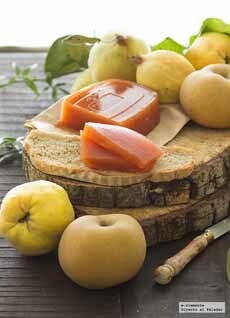 Membrillo (mem-BREE-yo) is a semisoft cheese condiment that is quince paste: brownish-red, firm, sticky. It is made in loaves, and sliced to serve on cheese platters. It is more accurately called dulce de membrillo in Spain, Italy, Israel and Latin America, to differentiate the the fruit itself (membrillo) from the fruit paste (dulce de membrillo). The name changes to marmelada in Portugal and Brazil; pâte de coing in France; and quince paste in English-speaking countries. A relative of the apple and the pear, quince is high in pectin, and the resulting paste has the consistency of a thick jelly. It has a sweet and tart taste and looks like a dense block of gelatin. You can buy it or make it (membrillo recipe). Homemade membrillo is a very nice gift for foodie friends. If you buy it, purchase it at a cheese store or specialty store. You can buy it packaged in Latino food markets, but it’s (understandably) more commercial, less elegant. Traditionally membrillo has been served with Spanish cheeses like Mahón, Manchego and Roncal. But just as fruit can be served with any cheese, so can membrillo. It also pairs well with nuts and other salty and savory foods. And, it’s a substitute for guava paste. In addition to serving quince paste, the fruit is cooked (braised, poached), used to make pies, spreads (jelly, jam, marmalade), desserts (cake, ice cream, pie) and sauces (including a version similar to applesauce). Accent a grilled cheese or ham and cheese sandwich (especially with Manchego or similar cheese, such as Cheddar or Jarlsberg). Add to a charcuterie board. Assemble canapés of membrillo, Manchego and serrano ham on toast. Bake into fruit bars or thumbprint cookies, substituting for preserves. Breakfast toast: Instead of jam, spread cream cheese or other soft cheese over toast, and top with a thin slice of membrillo. You can also make quince butter to spread on toast. Create a glaze for roast chicken, lamb or pork. Combine membrillo with stock and whisk over heat into a sauce; whisk in some sherry vinegar at the end. Baste regularly (also baste with the pan juices). Garnish cheesecake, serving a slice of membrillo on the side, or creating a membrillo glaze for the top. Make dessert puffs: Cut puff pastry dough into 1- x 3-inch strips. Top with quince paste, goat cheese and chopped fresh rosemary onto each strip, then pinch the outer edges together. Bake at 350°F until the pastry is golden, about 12 minutes. Make gougères with Manchego cheese, and include a piece of membrillo. Serve for dessert with cream cheese, goat cheese or mascarpone. Spread onto crostini or bruschetta, with cheese of choice. Sweet Foods: Quince is used to make jam, jelly, quince pudding, pies and tarts. Adding a dice of quince to applesauce and apple pies enhances the flavor and texture. It can be baked, braised, poached or stewed and served as a dessert or a side with meat and poultry. Turn into a salsa for fish: a tiny dice of membrillo, figs, lemon, basil and marcona almonds. Turn into syrup. Whisk with water over heat to create a syrup for yogurt, fruit and desserts. Try it as a sweetener for tea and in cocktails. Most varieties of quince are too hard and astringent to be eaten raw. Cooked, quince become flavorful and aromatic. It may well be that the fruit Eve fed to Adam in the Garden Of Eden was not an apple but a quince (the edible variety is Cydonia oblonga, not to be confused with the ornamental genus, Chaenomeles). The book of Genesis does not name the specific type of the fruit that Eve picked and shared with Adam. Cultivation of quince preceded apple cultivation in the area. Many early references that have been translated as “apple” may in fact have been quince. Quince is also presumed to be the “golden apples” of the legends of antiquity. Quince is related to both the apple and the pear. It looks like a combination of the two: a large, lumpy pear. Native to the Caucasus, the mountain range that separates Europe and Asia, quince trees originated in the deciduous forests in the foothills of the Caucasus mountains, stretching east from Iran and Turkestan. The fruit was subsequently grafted and bred by the ancient Greeks, to produce quince with an exceptional quality [source]. The Greeks loved quince. Quince was sacred to Aphrodite, the Greek goddess of love and fertility. Plutarch notes that Greek brides chewed on a piece of quince to get sweet-smelling breath before entering the bridal chamber (what about the husbands?). They were also set in bowls to perfume the area with their aroma. The Romans continued the Greek tradition, often representing the Aphrodite’s counterpart, Venus holding a quince. They also gave quince to newlyweds for good luck and fertility. Quince appears in the art of antiquity: from wall paintings and mosaics in Pompeii, to ancient Babylon. After the discovery of preserving foods in sugar, in the fourth century C.E., Roman agriculturist and writer Palladius baked quince honey strips, which turned quince into a spread. As early as the seventh century, recipes for jellies prepared with quince juice and honey began to appear. In the Middle Ages, quince was also highly valued. It was often served at tables of monarchs and aristocrats. The alchemist and confectioner Nostradamus left several written recipes for quince compote [source]. The tree spread throughout southern Europe and up to England. Quince trees were first recorded in Britain in 1275, when Edward I planted them at the Tower of London. Recipes from the 13th and 14th centuries include quince pies. The fruits remained popular in the 17th and 18th centuries, but were ultimately edged out by apples and pears, which are enjoyable to eat raw (quince are not). From England, quince traveled to Colonial America. Jefferson grew quinces at Monticello. If you’re so inclined (and live in zones 5 through 9), quince is easy to grow: self-pollinating and almost impervious to pests. Membrillo is the Spanish word for a fruit paste condiment and the fruit from which it is made: quince. The name membrillo comes from the name for the quince tree’s branches (the tree is Cydonia oblonga). When the branches are new, they are tender, flexible, and highly resilient, just like wicker: mimbre. “Membrillo” is the diminutive of mimbre.